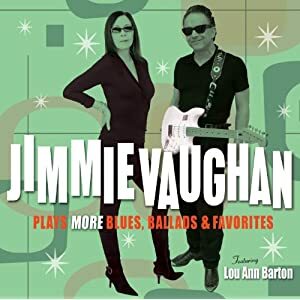 Jimmie Vaughan is releasing a sequel to his acclaimed, Grammy-nominated 2010 release Plays Blues, Ballads, & Favorites with Plays More Blues, Ballads, & Favorites on July 26 through Shout Factory. Vaughan, founder of the iconic Fabulous Thunderbirds and a successful solo artist, has put together a collection of 14 songs written or performed by luminaries like Ray Charles, Hank Williams Sr., Jimmy Reed, Lloyd Price, and more. He recorded the set in Austin, TX and is joined again by vocalist Lou Ann Barton on three tracks. Barton provided vocal on several tracks of the first volume. The first installment was Vaughan's first record in nine years, so this is warp speed for a man who had platinum success in the '70s and '80s with the Thunderbirds. Vaughan also won accolades for the duet album he recorded with his younger brother Stevie Ray, Family Style, just prior to the prodigy's death. It's going to be a huge summer for blues and blues-rock releases with new sets from Vaughan, Kenny Wayne Shepherd, Grammy-winner Keb' Mo', Grammy-winner Tom Hambridge, and Kansas-based duo Moreland & Arbuckle releasing records at the end of July through August.